"Simple, inexpensive -- and my children gobble it up! My 9 year-old has even made this for us. :0) Note: you will need whatever ingredients the cornbread mix calls for. Jiffy® calls for 1 egg and 1/3 cup milk. Egg substitute works well, too." 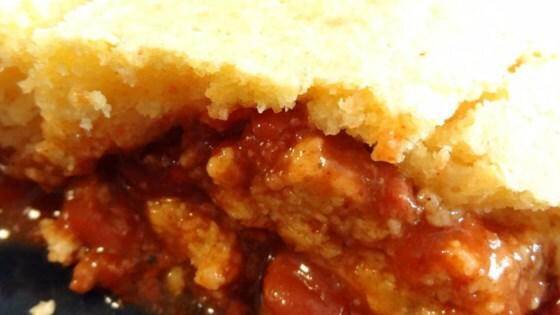 Pour the turkey chili into a 9-inch pie dish. In a bowl, whisk together the corn bread mix, milk, and egg until slightly lumpy; spoon the corn bread batter on top of the chili. Bake in the preheated oven until the edges of the corn bread begin to brown and the center is set, 20 to 25 minutes. Sprinkle with Cheddar cheese and a dollop of sour cream. Great, easy dinner. Have made multiple times now and in order to cook all the way need to bake for 20 min, then cover with foil and bake another 20. Very easy. Very tasty and filling. Perfect for a cold rainy night. Yes, I'll make it again. However I may try it with only one can of chili if making it for just my daughter and me.